A photo of Mars from NASA's Viking spacecraft, which launched in 1975. Mars apparently had a massive growth spurt when it was young, mushrooming to about half its present size in less than 2 million years, scientists say. The rocky planets in our solar system are generally thought to have formed through titanic collisions between massive planetary embryos roughly 600 to 3,000 miles (1,000 to 5,000 kilometers) wide. For Earth, the last of the collisions apparently involved an impact with a Mars-sized protoplanet, and formed the moon 50 million to 150 million years after the birth of the solar system. A comparison of the sizes of planets venus (left), Earth and Mars. The planet Mars is the fourth planet from the sun and named after the Roman God of War and is also called the Red Planet.See what makes Mars tick with this Space.com infographic looking inside the Red Planet. These findings suggest that Mars was a protoplanet that escaped merging with its siblings. "Mars is an embryo," researcher Nicolas Dauphas, a geochemist at the University of Chicago, told SPACE.com. "When we look at that planet, we in fact look at the same material that made the Earth." To learn more about how the Red Planet grew, scientists analyzed data from rocks blasted off Mars by cosmic impacts that subsequently landed on Earth. These rocks are volcanic in nature, and once were magma from deep within Mars — as such, they are essentially snapshots of how the nucleus of Mars evolved over time. The scientists detailed their findings in the May 26 issue of the journal Nature. The researchers examined data on specific isotopes within these Martian meteorites. Isotopes of an element all have the same number of protons in their nuclei but differing numbers of neutrons — for instance, carbon-12 has six neutrons, while carbon-13 has seven. The unstable isotope hafnium-182 naturally decays to form the stable isotope tungsten-182, with about half a given amount of hafnium-182 decaying to tungsten-182 every 8.9 million years. By analyzing the ratios of those isotopes as well as others in the meteorites and in chondrites, the building blocks of all planetary objects, one can pinpoint how old the Martian rocks are. 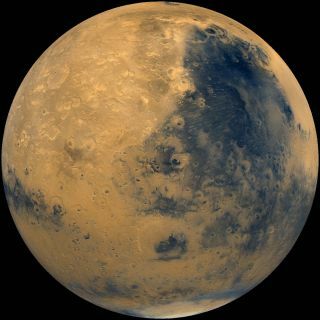 In previous studies, scientists found large uncertainties in the formation history of Mars because of the unknown composition of its mantle, researchers said. The new study should help change that. "Now we can shrink those uncertainties to the point where we can do interesting science," Dauphas said in a statement.